I'll be honest, I've never seen the Disney XD show Pickle and Peanut. The cartoon stars a peanut and pickle that get into adventures (I think? ), and that's cool with me. But I might have to tune in tonight when Pickle and Peanut gets all '90s. The giant legume and the food formerly known as Cucumber run into a bear at a garage sale (I think?) that they realize was the star of their favorite cartoon, '90s Adventure Bear. 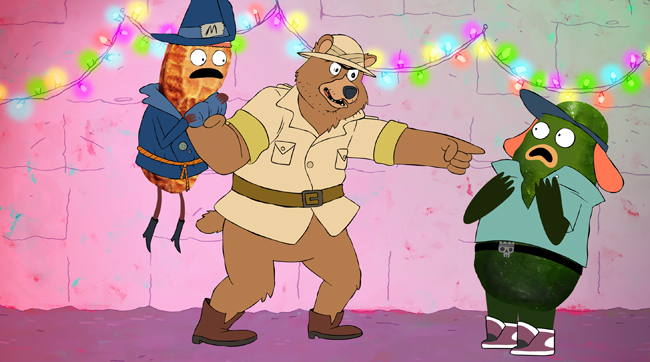 And Disney XD got a true icon of the 1990s — Shaq — to bring '90s Adventure Bear to life. The very special Shaqisode of Pickle and Peanut airs tonight at 9 p.m. EST on Disney XD.